D.C. permits for food truck operators don't allow them to do business along the Mall. WASHINGTON — This weekend, the U.S. Park Police arrested eight people along the National Mall for selling food to tourists. D.C. permits for food truck operators don’t allow them to do business along the Mall. Abdul Bangura, of Fort Totten, says he was arrested Saturday when the park police found him parking his ice cream van at 14th Street and Jefferson Avenue. “They cuffed me; put me in the little small car,” Bangura says. He was accused of vending in a geographically prohibited area. City regulations allow the park police to fine or even arrest vendors who set up shop along 14th, 7th and 17th streets, as well as Constitution and Independence avenues. The park police says food-truck permits have instructions to avoid vending along the Mall. Bangura thinks the push to have them move off the property is to help struggling food stands on the Mall. “They want those foods to sell, not the fresh one to sell,” he said. Ahmad Elhaj, who owns the DC Mediterranean Cuisine food truck, says he agrees. “It’s just about money,” Elhaj says. He says keeping the trucks off the Mall will put them out of business. “Between 7th and 14th, this is where we make $1,500 a day. If we go somewhere else, we’re gonna make $400,” he says. 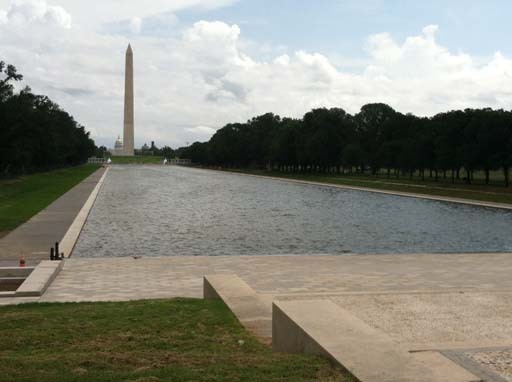 He thinks D.C. permits should allow food vendors to work the National Mall. The U.S. Park Police say the enforcement comes after mayor Vincent Gray signed an emergency amendment act that deals with regulating food trucks. Earlier this year, warning were handed out to food truck drivers parked along the Mall, but the time for warnings seems to have ended.